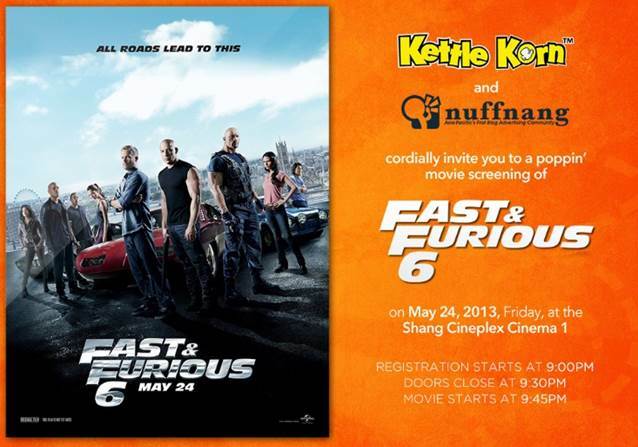 In Between the Covers: Verabear's Book Case: Free Passes for Fast6! As if getting free passes to a one good movie this year was not enough, we get to see another movie for free on Friday, yay! If you don't believe me, check out the announcement at the Nuffnang blog, my name is definitely there. Haha. :) I am taking the boyfriend of course, I will need his strong arms for balance and getting up and down stairs (I sure hope there aren't any). This will be the first time I'll go to a movie house since the operation. Hope all goes well for me. Hah! We will have to go there earlier than we did for Oz, so we can have better seats. Does anyone have a recommendation for a dinner place at Shangrila Mall? Are there any BC Bloggers going? Don't be a stranger!